Prolly a Philips Ultralume 5000K in diguise. Bought at Mesa, AZ ReStore. I love how white 5000k lamps are even on camera. Uggh. I hate the color of these things. My church facilities group that oversees 17 buildings purchases a bunch of cases of these in the T8 form to use in the Gyms in the buildings. What a headache they give me! 4100k is about all my eyes can handle. And yes they are Philips. Maybe a Natural Light rebranding? If its a really 5000K Ultralume I'd love to find some of those! What are the specifications of an Ultralume tube? It should be at least 90. I said 82! Ultralumes are triphosphors. 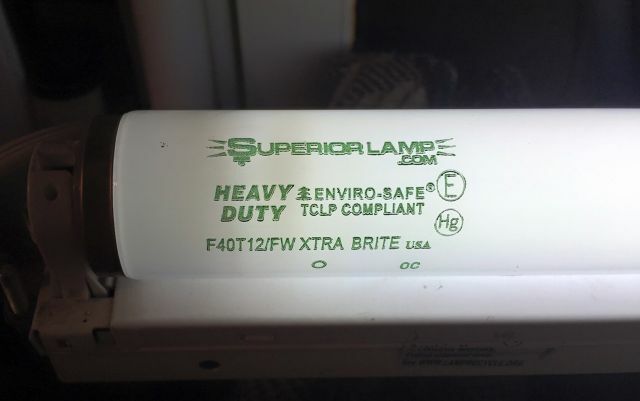 No, I'm saying that for a better light, which these are marketed to produce, it should be at least 90.